Danny Lyon was the first photographer for the 1960s civil rights group the Student Nonviolent Coordinating Committee. He documented and joined the Chicago Outlaws motorcycle club for his classic 1967 book The Bikeriders. 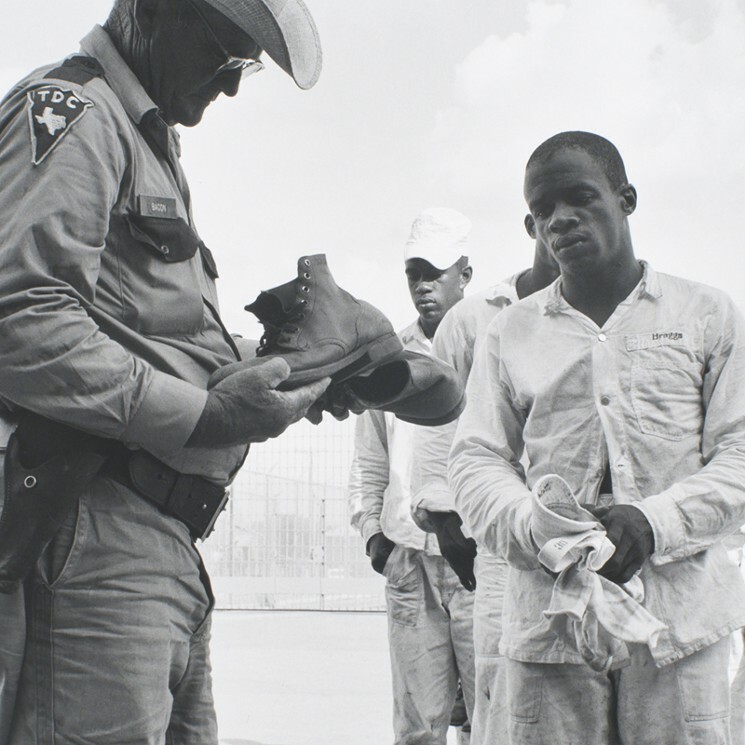 He wrangled permission to photograph inside the Texas prison system, which resulted in his 1971 book Conversations with the Dead. A writer as well as a photographer, Lyon is an incredible raconteur. He was part of the New Journalism that shunned objectivity for personal involvement in the story. Lyon is refreshingly blunt, matter-of-factly profane and an old-school liberal activist. Selections from 50 years of his work are on view at The Menil Collection in “This World Is Not My Home: Danny Lyon Photographs,” curated by Toby Kamps. Lyon’s photographs from the SNCC period are the first images you see when you walk into the mostly chronologically arranged exhibition. A starkly graphic black-and-white SNCC poster reads “NOW,” with a young black man’s arm raised up against a blank sky, as if to touch the letter “N” in the word. Another image, Demonstration at an “All White” Swimming Pool, Cairo Illinois (1962), presents a contact print of four images. In each of them, black children wait in line, trying to enter a swimming pool. Their way is barred by a smug-looking white guy barricaded behind a table, on which rests a huge hand-painted sign that reads, “Private Pool Members Only.” In another image, Lyon captures SNCC members outside the funeral for the four little girls killed in the Birmingham church bombing and gives us a portrait of palpable grief in the face of Dr. Martin Luther King, in an image taken before he spoke at that same funeral. That all seems so long ago, but, in listening to 70-year-old Lyon, which I was able to do at the press preview, you realize how very, very recent that kind of horror was. In other work, Lyon photographs bikers or black transvestites in Galveston circa 1967, portraying them as individuals rather than subgroups or outcasts. Lyon got along with all of them, looking beyond the facades and relating to them as people rather than as some sociological project. The photo collages are the least successful works in the show artistically, their largely symmetrical compositions built around a central image, but their content is fascinating. One of them, the 1985 Rachel in Texas, is a collection of late ’60s photographs, including some of counterculture luminaries like activist and Woodstock emcee Wavy Gravy and acid advocate and Merry Prankster Ken Kesey. Lyon shared a Kesey story at the press preview. Apparently, Kesey was in town visiting Larry McMurtry back when McMurtry was teaching at Rice. McMurtry was trying to get some work done and called up Lyon and asked him to “get Kesey out of here.” Lyon didn’t know what to do with him — Kesey was a heavy drinker and, as Lyon explained, “I was more of a pothead.” So Lyon took Kesey down to a tattoo shop on Washington (the site of Lyon’s first film) to see this alcoholic tattoo artist. “These guys proceeded to get totally whacked passing this whiskey bottle back and forth while I tape-recorded them,” Lyon recounted. Kesey, on his way to London, kept talking about the Beatles and how he was going to meet the queen, but Lyon was much more interested in the tattoo artist and was running out of tape. Lyon kept shutting it off when Kesey talked so he could save tape to capture the tattoo artist’s conversation. That attitude defines Lyon’s interests and aesthetics. Lyon first came to Houston because he got access to the Texas prison system with the goal of making “a picture of imprisonment as distressing as I knew it to be in reality,” and the prison photographs are some of the strongest in the show. The plantation-like realities of the Texas penal farms are on display in an image of a black man in prison whites thrown into the back of a truck with heat exhaustion, a couple chunks of ice tossed on his chest for relief. The hard thing about the show as a whole is that it’s such a small slice of a huge body of work. Lyon has made an enormous number of films as well. (One of them, Los Niños Abandonados, made in 1975 and restored in 2012, was a film about Colombian street children originally funded by Dominique de Menil and rescreened in conjunction with the current exhibition.) Lyon tells stories, and the photos excerpted from the artists’ books make you feel like you are stepping into the middle of a story. They make you want more. I wanted to see all of the photographs and have the images build on themselves. Making things more difficult, most of the books aren’t easy to come by. The Bikeridersand Conversations with the Dead are out of print and pricey. Early editions of The Bikeriders are at least a couple grand, and a 2003 reissue still runs a couple hundred bucks on Amazon. But “This World Is Not My Home” gives you a nice sense of Lyon and his work. Sometimes there are artists who work with social and political justice issues who give you the feeling that the work isn’t ultimately about those issues. It’s really about the artist and how noble he is. You don’t get that with Lyon. He is involved with the world, his subject matter and his subjects because he truly cares about them. And that makes all the difference.